I've written about good taste and records before. Generally, I'm of the opinion that good taste is largely a curse; the bands and artists whose work deliberately appeals to good taste are rarely satisfying listens. While albums and bands can, in hindsight, seem to devolve into good taste (Bark Psychosis being a prime example with Hex, an album so perfectly in line with what's now "good taste" its wonder must surely be imperiled for the first time listener), there's a certain something--Fredric Jameson might call it an old-fashioned, modernist, "unique" style--that elevates such music above its influences, confluences, references, and progeny. Ultraista's self-titled debut album comes carefully packaged in not just good, but excellent taste. The press blurb on Temporary Residence's website notes the band's fondness for "Afrobeat, electronic an dance music, visual art, and tequila," a set of influences that lead them to produce their album "of highly infectious, exquisitely crafted electronic kraut-pop." To make it even more appealing, of course, the album is available (for a limited time only! Act fast!) on coloured vinyl. Oh, and it's Nigel Godrich's (he of Radiohead-producing fame) band, along with session musician Joey Waronker (famous to me for his drum work on R.E.M. 's Up) and Laura Bettinson, so you know the kids will love it. To put it bluntly: Ultraista are not capable of transcending their good taste. Indeed, their good taste is so conspicuous, so all-encompassing, that the album becomes kind of interesting despite itself. Good taste in music like this often registers as pleasant anonymity--it sounds good because I know it sounds good, so it doesn't actually have to sound like anything--and Ultraista's debut is no exception. The concern to appear hip turns the album into a rigidly controlled screen, a surface that's impossible to get beyond. Studiously mixing the same three or four elements (essentially: metronomic, Teutonic funk drums; buzzing, swirling synths; icily detached vocals), the band's sound presents itself as a blank, a cipher. You can hear anything in this music: it's contemporary (parts of sound more like The King of Limbs than The King of Limbs did, others are vaguely in line with chillwave), it's retro (crucially, though, it draws from the 1990s rather than the 1980s, all mid-period Stereolab and early Broadcast), it's indie that has a shelf of European techno on vinyl to impress visitors with. For the most part, it's not even possible to distinguish the songs on the album by saying "that's the one with the . . ." or "it's the one that goes . . .," because its compositions are more of a piece than Music for Airports. In short, it's aggressively bland in its good taste, its pleasant anonymity. This is where it gets interesting, though, because nothing can be so bland and anonymous without transforming into something else. One of the most overworked remarks on a piece of music is Brian Eno's description of My Bloody Valentine's "Soon" as the "vaguest music ever to have been a hit," but I honestly do feel that something similar is at play with this album. Just when it's on the point of dissolving, when it has reached a point of maximum blankness, it becomes bizarrely appealing. Temporary Residence credits the musicians with "masterful control over the pure anatomy of a pop song," and the description is not wrong, though for different reasons than the label would suspect, I think. This is pop music transformed into observed pop music--it knows very well how pop songs work, and it's able to demonstrate how they work to the listener without ever doing the things pop music does. This isn't music that inspires an emotional response in the way that a Top 40 hit will, but it offers a clinical deconstruction of how the Top 40 hit does this by turning the pop song into the unreachable world behind the screen of Ultraista's music. Take opener "Bad Insect," which rewrites Radiohead's "Bloom" and suggests how pop music can be exhilarating without actually ever raising your pulse. Emotionally, this music is flat, devoid of affect, and more interesting for it. The minimalism in terms of sound design works to the song's advantage in focusing attention on the surface. This is taken to even greater extremes in the middle of the album, with "Our Song" and "Easier" anonymous enough to become almost offensive, to retain a certain grain of reality, a kind of productive irritation that suggests the songs are as much theorizing about the music they sound like as functioning as actual songs. Indeed, the album falters at its busiest, when the spell of its good taste, its vagueness, is broken. The songs that fall victim to this (hyper)activity become genuinely irritating, as on the grating "Smalltalk" or the chirpy "Static Light." Perhaps the oddest song here is "Gold Dayzz," which ends up with a kind of sub-Trish Keenan vocal that sounds lazy in the wrong ways, a curse that also plagued the Godrich-helmed King of Limbs. Bettinson's detached vocals are put to quite good effect elsewhere, though, as on "Strange Formula"--which is practically sub-zero in its icy loops of voice and synth--or the brilliant closing troika of "Party Line" (the album highlight), "Wash It Over," and "You're Out." What makes "Party Line" immediately noticeable is its deviation from the rest of the album's tonal palette. Foregrounding a piano line that feels snatched out of an adult alternative song designed to soundtrack graduations, the song supports itself with buzzing synths and a gently insistent bass that work brilliantly to catch the ear. The final two tracks are content to drift along aimlessly, threatening to lose all semblance of form at any moment, to lose sight of the pop structures they so carefully work to ape and to dissolve into pure sound, and the better for it. Ultraista is, ultimately, an odd release. It seems too studied and mannered to have had its most appealing qualities (vague formlessness, anonymity) in mind. Nevertheless, the songs here tend to work as a kind of new twenty-first century ambient art-pop, plundering the cool bits of the past and reassembling them into the precise shapes that are now able to be only just heard and distinguished from the general background noise of life--a YouTube video playing in the background of your cubicle while you do work, the sound turned down so as not to disturb coworkers. 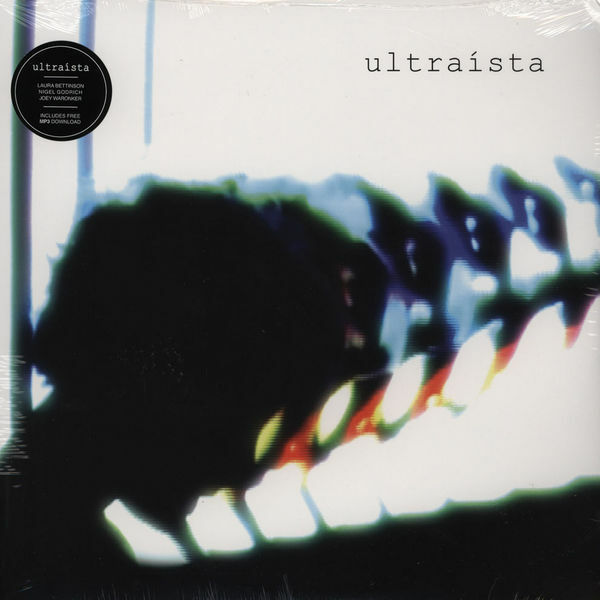 Ten years ago it would have been a hit, and ten years from now it might be again (or it might sound like nothing at all, its good taste silencing it), but at this moment Ultraista's debut is weirdly adrift. As I listen to it, I think about Neil Kulkarni's "A New Nineties" series at The Quietus. Whereas his columns reclaim an alternative decade to the Alternative decade, Ultraista are like a band of Rip Van Winkles who fell asleep when bands like Eleven were making albums like avantgardedog and that dog. were making Retreat from the Sun and awoke in 2012. Whether there is any place for them (or any point to them) remains the question, though; where Rip eventually settles into a blissful senescence, free to be the idle raconteur he always wished to be, I think Ultraista will never quite find another time they fit into.